I Live in Wait... How Many Square Feet? Hello dearest New Minimalism Readers! Kyle, Redesign Specialist here to introduce the newest series on the NM blog, 340-Squared in which I will share my insights from life in the one-room studio I now call home. 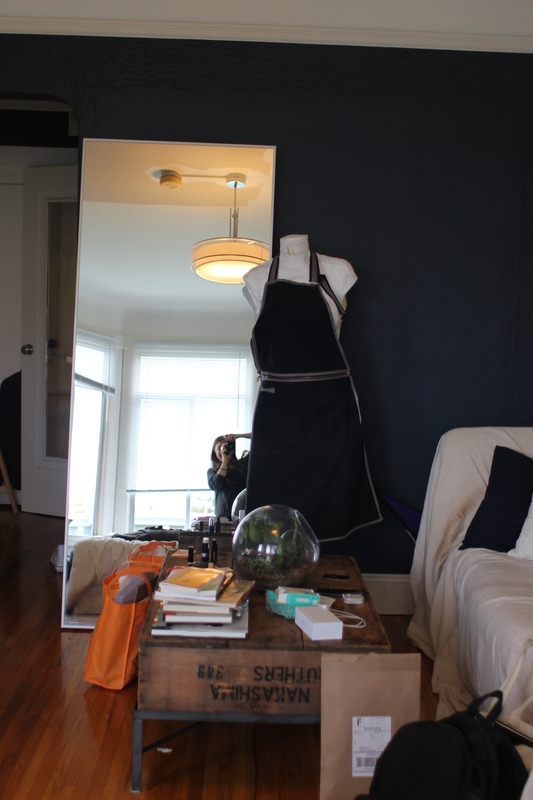 Prior to this apartment, I had been living in a magical situation in a friend’s storefront-turned-living-space near Alamo Square. It was raw, creative, and we had the freedom to experiment with décor (How about a giant pink geometric mural? Hell yes!). Having lived there for over two years, the space saw its fair share of events and parties, and even played host to one beautiful wedding. But eventually the master tenant, and my dear friend, decided he wanted to live alone. While the housing market in San Francisco is moderately insane at the moment, finding a new home could not have come at a better time for me personally. 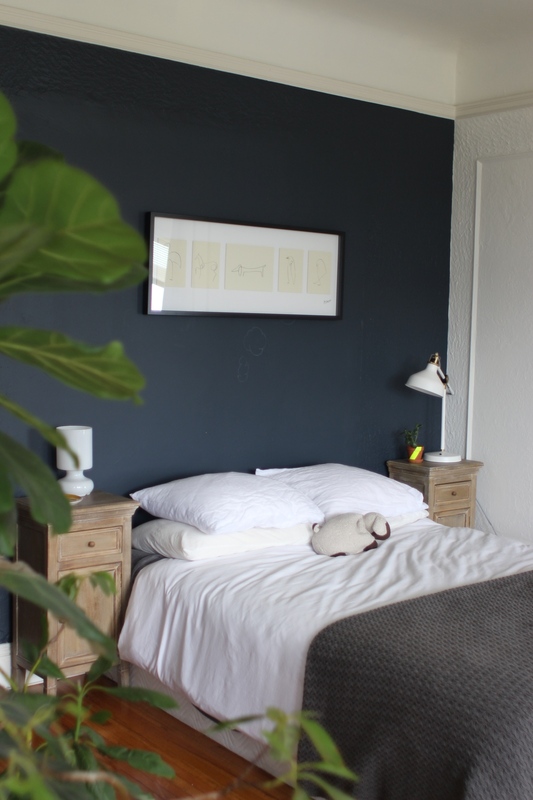 I loved my unique space, fun roommates and absurdly affordable rent, but my partnership with Cary and New Minimalism was just gaining traction and I longed for a sanctuary to gather my thoughts. Additionally, having a near obsession with clutter-free spaces and clean floors, living alone would allow me to truly practice what I preach at New Minimalism. In some ways, this was basically an investment in my career. I am SO excited to introduce you all to the newest member of the New Minimalism team: Kyle Quilici. She will be heading up the redesign portion of our services when she's not busy drinking cold-brewed coffee or hanging with her pup, Dolly. I hope you'll enjoy getting to know her and I highly recommend following her redesign and small-living adventures! What 5 words would you use to describe your personal style? Bold, playful, clean, simple & a little weird. How would you design your "perfect space?" That’s a tough one. A perfect space depends on its functionality and the people who use it. If it supports the functions of its users and reflects the values of those users, then it is darn near perfect. Of course, there are some basic elements that help beautify a space, such as abundant lighting (natural, as well as artificial), tall ceilings, good ventilation, and sweeping views. How did you come to learn you were passionate about design? When I think back, I have actually been “planning” spaces since I was a young. I used to draw layouts of my dream ____ (insert little girl fantasy here). I recently came across a drawing I made in middle school of the perfect horse stables. Ha! In high school I began to develop my eye in photography class. I continued photography throughout university, and found I was attracted to the personalities of interior spaces. Fast-forward three years: after some serious goal coaching and soul searching I whittled my vast interests in design down to interiors. Living in New York at the time, I enrolled in an Interior Design Intensive at Parsons. Dissatisfied to learn that the traditional teachings of Interior Design did not speak to my values for sustainability, I re-routed and pursued my certificate in Sustainable Design. 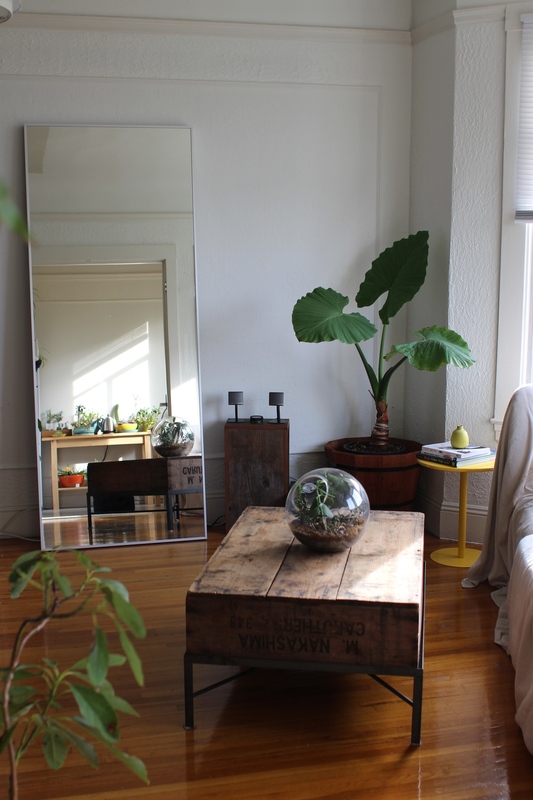 What objects in your home do you feel like best showcase your values and personal aesthetic? This is an important question that everyone should be able to answer with, “Everything!” I am intentional about every object that enters and lives in my home with me. If I do not love it, if it does not serve me well, then it does not stay. Living with roommates means that compromises are made. But as long as we communicate with each other, everything runs smoothly. What are you in love with these days? I try to avoid trends, especially in terms of interior spaces. But I am naturally attracted to the bold statements of large graphics. The intersection of digital media and design is a fun place to explore. I love the wall coverings from Flavor Paper and the playful products from AREAWARE. What are your favorite design books/mentos/websites? I intentionally keep my rolodex pretty simple, otherwise I find that I exacerbate the desire to accumulate more material things. To keep abreast of the general conversation, I regularly reference DesignSponge and The Satorialist. And of course, Béa from Zero Waste Home is also an inspiration. How do you find inspiration in your daily life? It’s everywhere! I make an effort to always pay attention, try new things and meet new people. What do you think is the greatest misunderstanding people have about space clearing? I think that people assume it is a huge undertaking. While simplified living is a way of life, it is not done in one fell swoop. It is a muscle that you learn to use and you use it regularly. I have a basket in my room for clothes to donate/sell, just like I have for laundry. What is your favorite part of helping people clear their space? Satisfied clients! I love when they begin to understand the real energetic effects of their belongings and feel empowered to take control. I also personally love the challenge of figuring out the best use of a space. I always loved Tetris as a child. Why do you feel space clearing is important? When you feel at peace in your surroundings you can focus your energy on attaining greater goals in life. I must acknowledge that having too much is a luxurious problem to have. So, I see space clearing as my contribution to the reality of my immediate community. I view the world as one large, dynamic ecosystem. If some people have too much, and others have too little, why not help to redistribute some of those goods? Of course, solid design plays a pivotal role as well – investing in durable goods that do not deplete the natural systems we depend on is also quite important.